Danny Trott, 5, 781 Manley Dr., San Gabriel and Nina Vaughn, 5, of 1537 South Walnut Street, San Gabriel. 22: Same as above without Danny Trott. 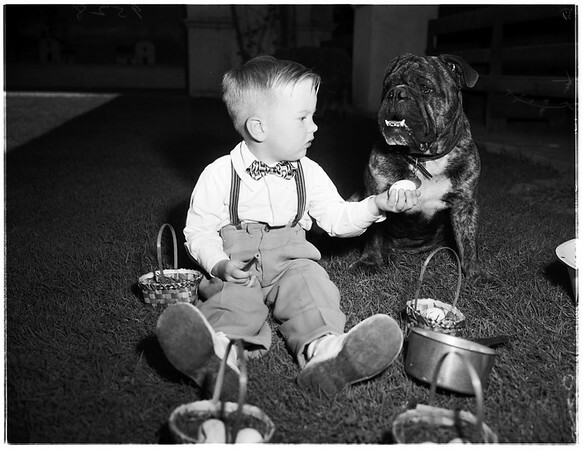 116, 117, 200: Jackie Robertson, 3, of 319 North Sierra Vista, Monterey Park, seen with bulldog 'Jiggs' and lamb, 'Snowball' at the Egg Coloring event in San Gabriel. 201: Jackie Robertson, 3, looks in egg coloring pan while playmate, Susan Hay, 4, of 116 East Fairview Avenue, San Gabriel prepares to dip egg in pan".